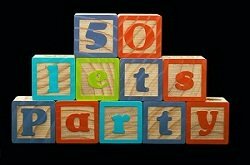 Celebrate this milestone with 50th birthday party games planned especially for the guest of honor. Don't think that just because someone is turning 50 that they don't want to play games! Turning 50 is not a cause for mourning. Here's my rule of thumb. If the birthday boy/girl doesn't have a problem with turning 50, then throw them the biggest party they have had to date!!! (If they do, take them out for a quiet dinner with just the two of you.) Life should be a celebration, and being on earth 50 years is a great reason to party. The bash of course must include party games. Don't think you HAVE to throw a black birthday party theme, though they are fun and need to be on the list of possibilities. You can go crazy and throw a youthful theme party complete with superheros, or trains, or the birthday girls favorite Disney princess. Either way will be a ton of fun. This is basic information that most every party planner already knows. But if you are new to planning, or just want a review, start with this simple to do list. Write it all down: Make a list of Everything! Get a notebook, use the comptuer, whatever your preference, but start by getting all your ideas on paper. Choose a Theme: This is the basis for everything that follows... Invitations, Food, Decorations, Balloons, and Games. Invitations: Match the theme. I know it's popular to send invitaitons via the internet or other social media outlets. And that may be your style. But at least consider the possibility of sending old fashioned, hard-copy invites. And it has been my experience that if you hand deliver the invitations, you will get a larger percentage of people who will attend. If you really want a big crowd, then attach a special item to the invitation that makes it stand out. This creates a buzz among the guests even PRIOR to the party. Menu Options: Your menu choices don't have to be extravagant or fancy. Everyone loves to eat regular comfort food. Maybe you will want to upgrade from hot dogs and hamburgers... but still have lot's of familiar things to choose from. Fresh fruit... make your own sandwiches... BBQ something... marinated chicken... salads... Mexican Style buffet. All good choices. Don't drive yourself crazy with new recipes... and if your friends can cook... Go potluck. Decorations: Again, go with the theme. Helium balloons are still appreciated and fun at any age. Matching paper products are great if you are using an informal theme. There are plenty of themed paper plates from which to choose. Helium Balloons: Every party needs them! Balloons can be fun and exciting. They can also dress up a formal affair. Consider making your own simple balloon arch with Link-O-Loons. Preserve the Memory: If your the host, don't be the one taking all the pictures. You need to relax and enjoy the party as well. Ask a friend to help with this part. And even better if you have someone else who can take video as well. Party Games: Choose the games that best match the personality of the group you have invited. There are several choices on this website alone, but feel free to venture out and consider other games. Especially if you have chosen a youthful theme just for fun. Play 50th birthday party games that compliment the event. Solicit Help: Don't try to do it all yourself. You will be to tired to enjoy the event and you won't have time to just have fun. You will get lots of offers for help (they are your friends and family) so take them up on it. You could assign someone the task of choosing the 50th birthday party games for you and bringing all the necessary items that go with it. Planning a party can be tedious and time consuming and even exasperating. But... if you start out organized, chances are you will stay organized. Remember... this is supposed to be fun. You will be sharing a day with family, friends and/or co-workers.